Widely grown as an indoor plant Kalanchoe blossfeldiana has a lot more going for it than it seems. 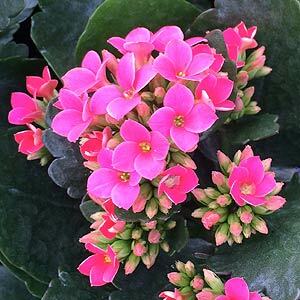 This is a hardy perennial, flowering from winter to spring, and Kalanchoe blossfeldiana comes in a number of varieties with flower colour from yellow and pink to bright red and orange. So add a little colour to the outdoors as well with this useful landscaping plant. These are a perennial plant originally from Madagascar, the deep green foliage is attractive through the season, however it is the waxy flowers that are the main attraction. This is a frost senstive plant, however they can be grown in protected positions outdoors in cool areas. They work well in hanging baskets, and you can even get double flowering varieties. Flowering from mid winter to spring they offer great colour during a sometimes dull period in the garden. A perfect plant for growing indoors or an a sheltered patio where it will bring masses of colourful flowers held neatly above the foliage, over a long period. Best flowering will occur with cool night temperatures (10-15C), warmer daytime temperatures (20 – 25C) and good light. Kalanchoe blossfeldiana is easy care indoors, bright filtered light and a well drained soil are the main requirements. Fertilize with a liquid seaweed fertilizer after flowering, and every month during active growth, however allow the soil to dry a little between waterings. Spent flower heads can be pruned away, this will encourage a second flush of flowers. Keep plants away from cold drafts. Cut back on water during the winter months. You can also grow them outdoors in a protected position in light shade. In cooler areas full sun works well and as long as they do not receive to much water during winter they will thrive. Try planting them in garden beds beneath the eaves of the house in a well drained garden bed. Or in containers using a free draining potting mix. Deadhead after flowering and pinch back the new growth tips to promote a more bushy habit. Easy to propagate from stem cuttings taken in spring. Cuttings need to ‘heal’ before planting into moist potting mix. Maintain humidity until signs of new growth. Cold and frosts need to be avoided.